Toddler recipes that aren't nearly as confusing as Gwyneth Paltrow's. 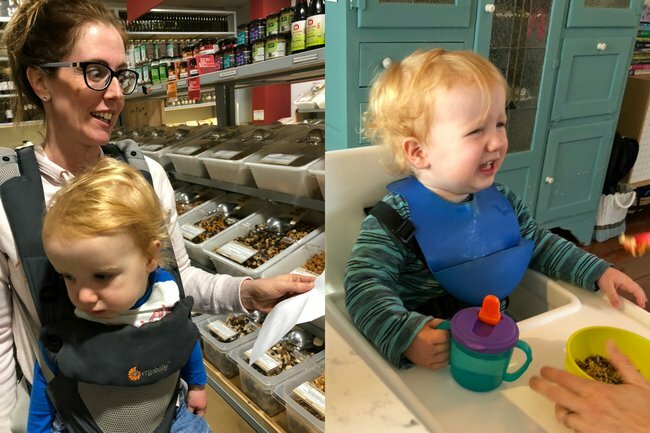 "Here's what happened when I tried to feed my toddler like Gwyneth." Feeding toddlers is a daily drama, isn’t it? Do you make the effort to cook something fancy and risk them throwing it on the floor while you cry into your Pinot Gris (or 11th coffee? ), or do you just dish up some scrambled egg and toast and say ‘job well done’? Like most parents with fussy under-threes, I vacillate between those two examples, sometimes I get experimental in the kitchen, and the rest of the time I wing it as best as I can. The other day while sifting through some inbox life-admin I came across an email I was about to hit ‘delete’ on when I thought perhaps I was being unfair. Most of you will be familiar with Gwyneth Paltrow (or GP as she is known among super fans) and her ‘Goop’ lifestyle website which offers up inspirational ideas for cooking, home décor, wellbeing, beauty and travel. She has received a fair bit of flak over the years for some of her wackier ideas involving steam-cleaning your uterus, but her glossy recipe books sell many thousands of copies globally, so who am I to judge? 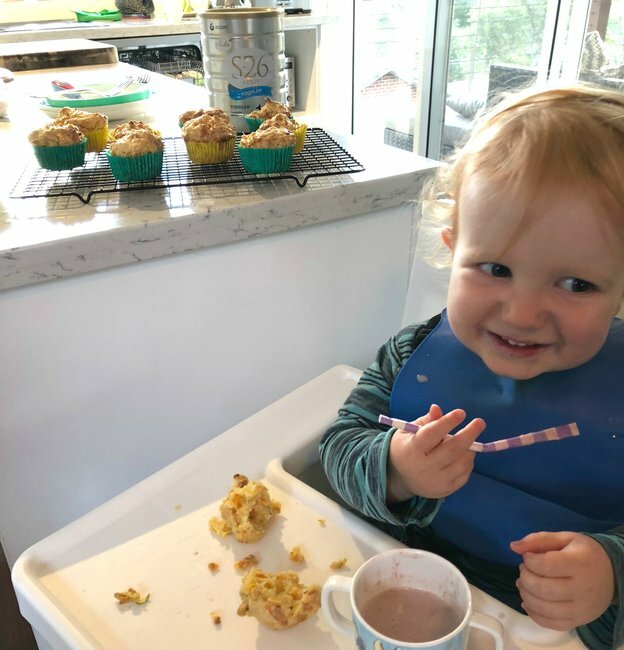 Deep in yet another family cooking-rut and in the spirit of GP’s ‘it’s all easy’ mentality, I decided to throw caution to the wind and trial two Goop-recommended ‘kid-friendly’ recipes on my unsuspecting toddler Leo, and his big brother Toby. I scrolled through the dozen or so online offerings including the ridiculous sounding ‘deconstructed chicken salad rolls with edamame’ but eventually settled on two recipes to push my toddler’s taste boundaries. The ‘lentil and chickpea salad with greens and pita’ – he likes baked beans so why not this? 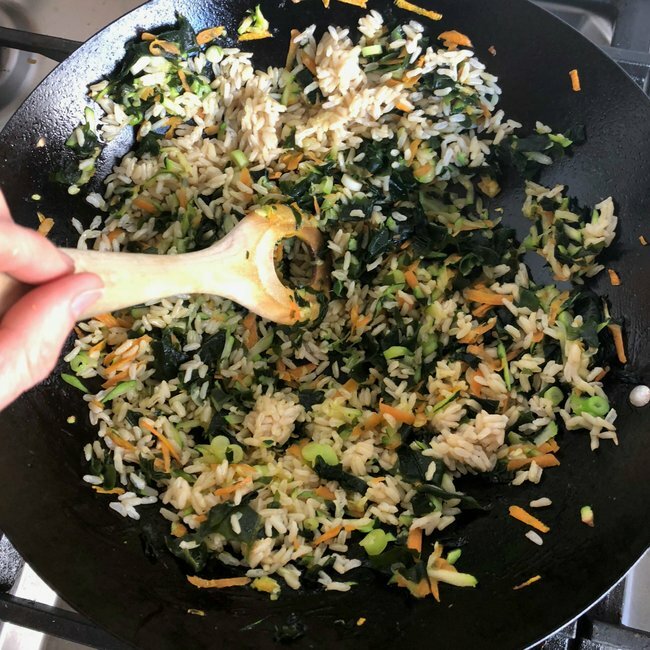 – and the ‘wakame seaweed and zucchini fried rice’. It’s all easy, right GP? After writing the very long shopping list, I immediately began regretting the whole experiment. 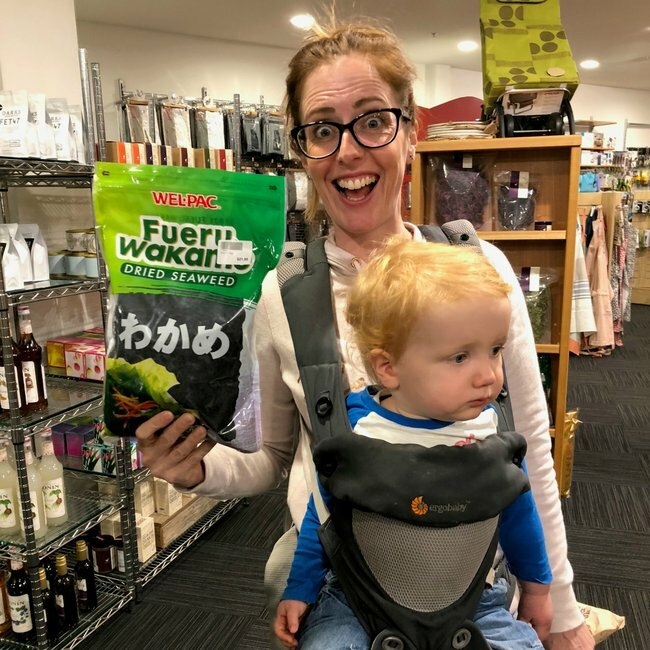 Wakame seaweed is also not something I use much of (call me a low-brow bogan if you like), so I needed to visit two speciality stores before finding an oversized bag for $21. I failed to find the edamames and while I could have gone to the Asian supermarket, I decided three grocery shops by 11am was pushing Leo’s tolerance levels enough. 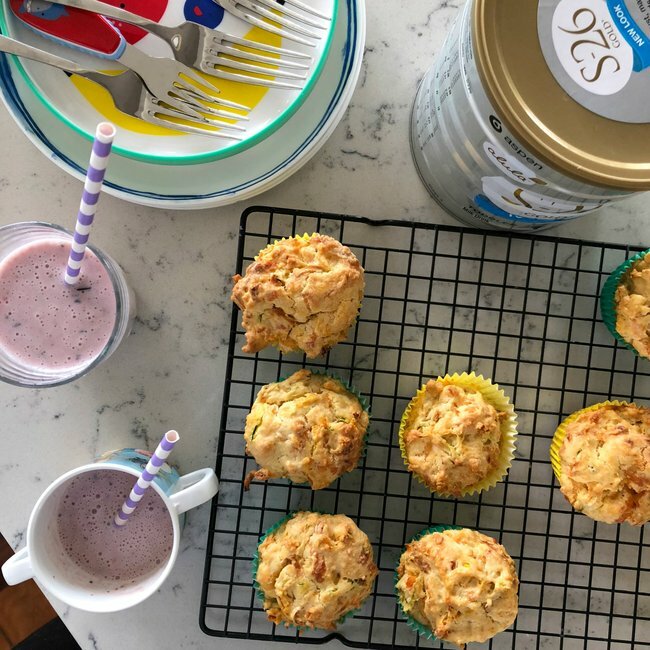 In case my experimental meals were utterly rejected, I picked up some cupboard staples for a couple of family favourite recipes - &apos;sneaky&apos; vegetable muffins and a mixed berry smoothie. 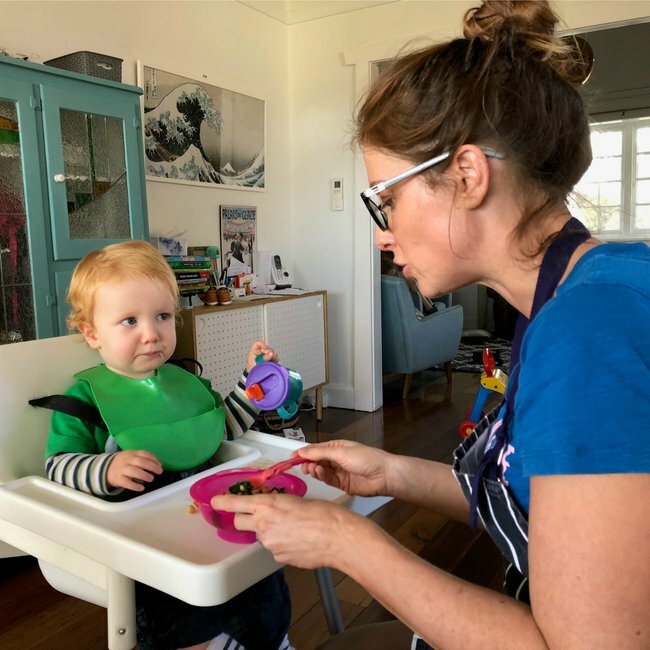 When we got home and unpacked the multiple bags, my eldest son Toby was keen to help me cook, so we put on our matching aprons and got to work mixing up the batter for the muffins. We used some grated carrots, zucchini, flour, oodles of sour cream, cheese and two scoops of prepared S-26 GOLD TODDLER. Why the toddler milk drink? Because S-26 GOLD TODDLER supports four key pillars of toddler nutrition with the Alula Toddler PlatinumCare Complex™. It contains nutrients to help support children&apos;s growth and development*, cognitive function*, immune system* and function of digestive enzymes*. It&apos;s an easy win for me because it goes so well in recipes for muffins and smoothies that Leo actually finishes - but more on that later. Once the muffins were baking in the oven, I turned in trepidation to the instructions for my first Gwyneth meal, the wakame fried rice. Step one was to rehydrate the seaweed in warm water - it was part-science experiment, part-cooking show. I made the sauce with garlic and ginger, organised some brown rice (I cheated with a microwaveable pack) and then got on with the cooking part which was a straightforward stir fry. Served with some sesame seeds as a flourish, it looked pretty good. Toby ate it and commented that "it wasn&apos;t bad" while Leo cried before I could get a spoon of the green stuff anywhere near his mouth. Rich in vitamins and minerals it may be, GP, but only if you can get the kids to actually eat it. Thank goodness for the veggie-packed cheese muffins. They went down a treat along with my quick and delicious smoothie made with blueberries, strawberries and banana that I chucked in the blender with half a cup of prepared S-26 GOLD TODDLER, some crushed ice and half a cup of strawberry yoghurt. See, I can do a simple no-fuss flat lay too. Image: supplied. For dinner that night I decided to try the Goop-recommended chickpea and lentil salad. It required me to assemble the salad ingredients, fry them up, sprinkle with lemon juice and olive oil and serve them with a side of wholemeal pita to my child who should joyfully eat it all up and be full of protein for the rest of the day. Lentil salad, fingers crossed. Image: supplied. It sounded so straightforward and while it went down better with Leo than the wakame seaweed, he only managed two bites before saying a forceful &apos;no&apos; and pointing towards the fridge. Thankfully those muffins came in handy once again. At least he loved the muffins and smoothie. Image: supplied. 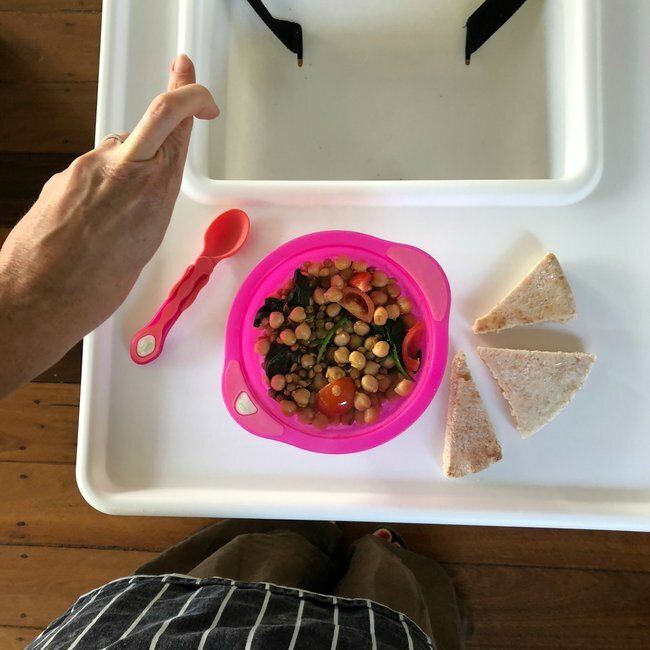 I can&apos;t say that my Goop cooking experiment was a total shocker, I certainly enjoyed eating the yummy rejected bowls of food and it was good to see Leo trying something new (the chick peas) and Toby stretching his tastebuds too. I&apos;m all for trying new things but when it comes to putting that much time and effort into sourcing (and rehydrating) the ingredients only to be cried at by a hungry toddler, I will mostly stick to cooking things I know my kids will eat and enjoy. Have you tried cooking something different for your kids? What was their reaction? Share your tried and tested recipes in the comments section below. * S-26 GOLD Toddler nutritious milk drink contains iron which supports toddler’s growth and development, cognitive function and immune system, and calcium which contributes to the function of digestive enzymes. Suitable when dietary intakes of energy and nutrients may be inadequate. In a perfect world, the perfect toddler would be a perfect eater. 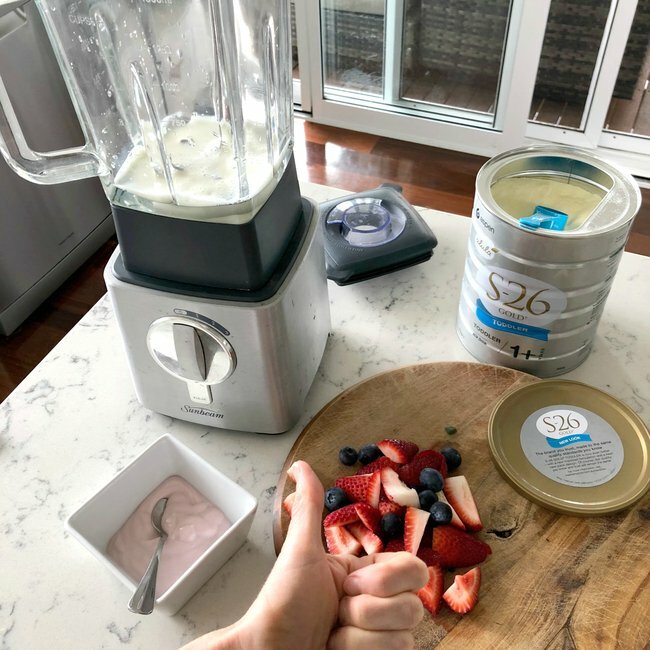 In the real world there is S-26 GOLD® TODDLER, a supplementary milk drink designed to assist your toddler when dietary intakes of energy and nutrients may be inadequate. S-26 GOLD TODDLER; supporting the 4 key pillars of toddler nutrition. The only nutritious milk drink formulated on the Alula Toddler PlatinumCare Complex.